At the core of HHhH are some dramatic, almost unbelievable events – heroic resistance on the part of the Czech’s and extraordinary courage in the face of considerable danger. Binet narrates these events well, and the climax of the book in particular is moving and gripping. 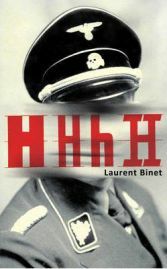 However, this is a quintessentially French novel, and just as slightly surreal inventive twists are a feature of some modern French Cinema (see Amelie or Gainsbourg) so Binet introduces a strong experimental element into HHhH. In this case, intertwined with the narrative, are the reflections of the author about writing the book and more generally about the challenges of writing historical fiction. The author becomes a self-observing additional character in the events, commentating on his own behaviour and motivation while also narrating the events of the novel. While this may sound a little irritating to some potential readers, I thought that it worked very well and it certainly added to my enjoyment of the book. So, when near the end Binet writes (of himself) “ I am coming to the end and I feel completely empty,” it summed up how I felt as a reader as well, though not just empty, but rather emotionally drained by the intensity of what I had been reading. At times HHhH reads like a history text, but as a reader I was left feeling unsure about how much of the book is fact and how much authorial speculation. In some places Binet says that he is speculating, whereas in others he will state something as a fact, only to correct himself a few pages later, saying that more information has emerged. His intention, in part, is presumably to remind us that much of what we believe to be history is in fact fictional speculation, an attempt to fill the holes which exist between a few available facts in a way which allows us to tell a persuasive story in tune with our contemporary mood and beliefs. These thoughts and others are likely to be provoked by HHhH in many readers, but perhaps it is enough to say that it is a well written (and translated) French novel telling an exciting story in a stimulating way.